Curated by Blaine Cooper, Elise Murphy + Claire Anna Watson. BLINDSIDE’s project End of the World Partypresented as part of our Curtain Call curated event series, brings together artists who tease out notions of catastrophe, celebration and transformation against the backdrop of the last party on earth. The 5,125 year Mayan Calendar comes to an end on the 21st of December and BLINDSIDE has invited artists to consider this cataclysmic event for its annual program Curtain Call. Will it be a nuclear meltdown of epic proportions, a scorched planet succumbed to climate change, or just time to reflect on a world that has shaped human consciousness? Are you ready for the final tribute to humanity? Will all apocalyptic prophecies be fulfilled? Fresh from the LA Art Fair, Adelaide-based artist Patrick Rees along with Melbourne-based artists Kirsty Audrey Hulm, Boe-Lin Bastian, Drew Pettifer and Joel Zika & Simon Pericich consider the possibilities. What’s in your survival kit and why? Nothing! I’m not sure the end of the world is something you can prepare for and I would never want to be the last man/woman standing. But if a chair and helium were available I think it would be a nice escape route. What are you going to wear to BLINDSIDE’s End of the World Party? An excellent dress, it’s a special occasion. What will you create in the face of destruction (for Curtain Call) and why? A floating chair a la Larry Walters 1982. He was an American truck driver who dreamt of flying, so he attached weather balloons to his lawn chair and shot into space. Although he survived the voyage, around ten years later he walked into a forest and shot himself in the heart. Only if you’ve already done everything you want to do. Do you believe the world is soon to end? Maybe humans will die out but I think the world will keep turning for a good while yet. My camera, to document the devastation. My usual buttoned up grey shirt and black jeans – it’s pretty much a uniform that keeps me ready for most occasions, Armageddon included. 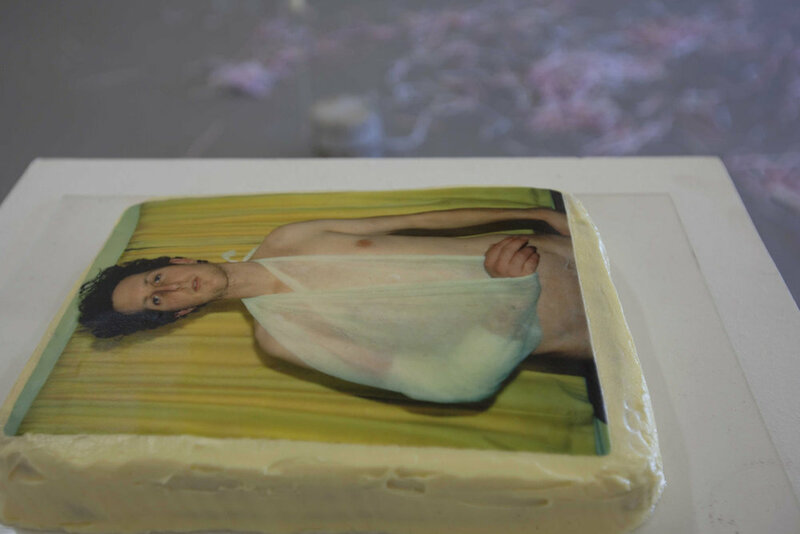 I will be making photographic images printed onto cakes. I think they encapsulate celebration and destruction all in one quite well. I don’t think total annihilation is in itself inspirational, but the human response to total annihilation can be incredibly inspiring. Quite possibly, but I think it will more likely be due to global warming or human-made destruction than because of some misinterpreted prophecy. Any symbols or signs from the old world that I can re-appropriate as the flag of my new rulership. Perhaps the light boxes from car dealerships. I could start the official federation of ‘Car City’. Black; because the world died along time ago – and it’s slimming. This work is about another world that ended many years ago. It was a world of rock and of roll and its leaders where glorious men and women (sadly mostly men). One day one of the rulers of this world decided to play a ballad, a slow and melodic song with heart felt emotion. It was to be the longest song ever to reach the top 10 and it would spell the end of the world as people knew it. Not really, don’t you always dream about being the only one left alive? I’d go to the barbecue shapes factory and eat just the topping. Yes, the world will end, as it has done many times before. I’ll know I’m getting too old when it actually annoys me. A clean pair of underwear – Mum always said pack a clean pair of underwear. I suppose I would also bring some blue cheese and peperoni pizza, has anyone ever had that? It’s great. However, I would pack the pizza and the underwear separately. Unfortunately, I will be in Los Angeles for the opening. I have found a great little doomsday cult here that have kindly offered me the opportunity to be beamed up to a spaceship that they have organized to fly over just before the impending Armageddon. I will be wearing a nice long gown that they have picked out for me, you can see it in the video, it is very comfortable. I am currently living in Los Angeles, California, the home of the ‘Doomsday Cult’. My video work is part video diary and part documentation of my attempts to convert myself into some conflated cult-hybrid that has little or no connection with reality. The work is also part anti-homage to the bizarre, yet ultimately quite sad and pathetic character of Marshall Applewhite, leader of the Heaven’s Gate cult, which once called California home. Unfortunately, I have come to believe that there may in fact be a little bit of Marshall in all of us. Yes, I suppose it is a pretty enlivening idea. The existentialists sure believed that the thought of some nihilistic void waiting for us out there in the future could act as a great emboldening force that kept us engaged and feeling very much alive in the presentâ. Though if it comes too soon I won’t be that impressed – or alive to be inspired by it. Well I suppose it depends what you mean by soon. The Mayans may well have picked the date precisely, in which case, well we are all pretty screwed. Of course scientists believe that in 3.5 billion years the sun will have become so hot that the oceans will boil and we will all be cooked, so it’s all relative really. However, by then we will have set up shop on Mars and every artist from earth will have exhibited there. There are no absolutes therefore no possibility for preparation. Accessories which function as objects of warfare. Humankind is unpredictable. Total annihilation is not possible in the human mind – we are not equipped to grasp it as a reality, so it’s best not to think about it. The world is constructed from energy and that energy will simply be displaced in a new form, at some point. There is no end, only change.